Definition: Characteristics or – using the generic entry "key figure name" – key figures whose values you wish to change. The exact values of those fields are defined in the parameter groups of the planning function, not in the function itself. Performance: The more fields are changed, the slower the function will become. 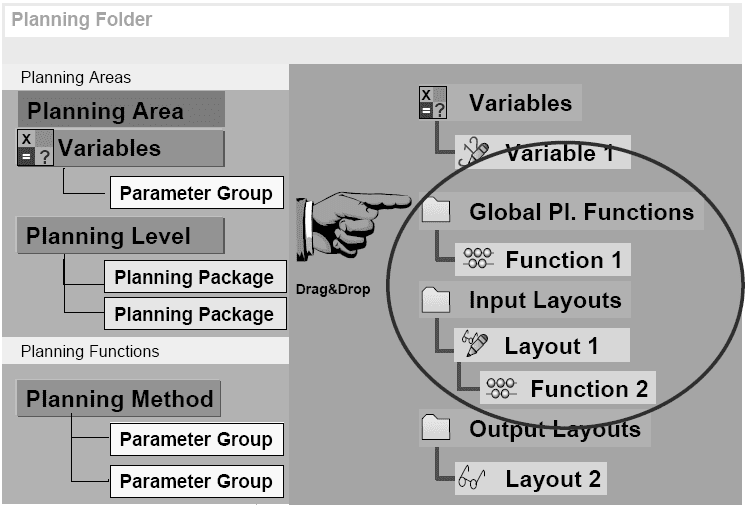 Definition: Characteristics for which deviating processing have to be specified based on the values of the characteristic.The exact values of those fields are defined in the parameter groups of the planning function, not in the function itself. Performance:The more fields are used in conditions, the slower the function becomes.Replace conditions with restrictions in the planning package. This will reduce the size of the package and at the same time avoid costly checks of conditions. Definition: Characteristics or – using the generic entry "key figure name" – key figures that are used to relate the new values to existing values.The exact values of those fields are defined in the parameter groups of the planning function, not in the function itself. Performance: If the reference data is not contained in the planning package, an additional database selection is necessary.If no other user needs access to the reference data, include the reference data in the planning package. No other user will be able to work with this data until it has been unlocked by the user. Get targets for organizations and Balanced Scorecards. 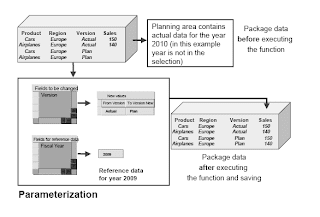 The delete function is used to remove data from the selected planning package.The records are not directly deleted from the Info Cube. The system rather creates additional records with offsetting values. The original and offsetting record will finally be deleted, when the Info Cube is being compressed. For performance reasons it is therefore recommended to compress the Info Cube on a regular basis (schedule a nightly job). There is a special delete function to remove records that are invalid according to the characteristic relationships. This function will be explained in detail in the unit about characteristic relationships. There's a special re post function to realign historical data according to the characteristic relationships. Push button: The user executes the function by clicking on a button. Execute before layout display: The function is executed before the planning layout is displayed. If the function changes data which is displayed in the layout, the changes are immediately visible in the layout. Execute before layout change: The function is executed when you exit the planning layout. 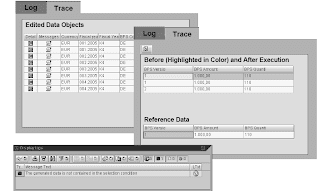 If the function changes data which is displayed in the layout, the changes are not immediately visible after opening the layout. You can exit the planning session without saving. This means that all changes (both to data as well as to the planning objects, such as planning levels and functions) which you have made since saving the last time will be lost. You can deliberately undo the data changes which were caused by the last execution of a planning function. All remaining changes that you have executed during the current planning session are not affected. You will find more information on these options in this section. 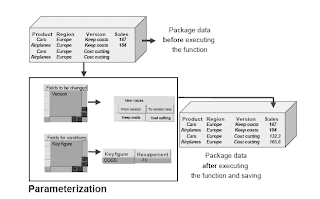 In order to be able to undo changes to data you must not have performed the following activities since executing the function that is to be reversed. You have not executed any further planning functions. 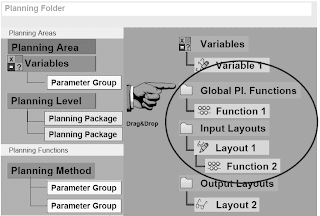 You have not navigated to any other element (such as, for example, displaying a planning area or changing a parameter group) within the planning environment. You have not saved the data. In web interfaces click on the Undo Button. The system does not take manual changes that have been made in the mean time into account. The data is restored in the form in which it was before executing a planning function – independent of whether manual changes were made in the mean time. From the context menu of the parameter group, choose Execute with Trace. 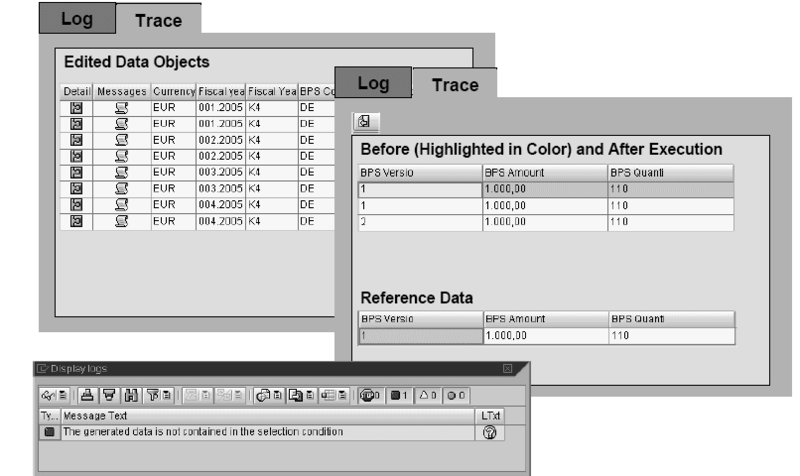 On the right hand side of the screen, switch to the Trace tab strip.The top part of the output shows a row for each combination that has been processed by the function. All fields that have not been changed are displayed.An icon next to a combination indicates if messages have been recorded. The lower part of the screen shows the Before and After picture for the fields were in the "fields to be changed".